The cover to Inhumans Prime. So we went over the ResurrXion books for the X-Men, now it’s time for the Inhumans. And for those who believe that, somehow, Marvel is trying to push the Inhumans to replace the X-Men, please note that which the X-Men got eight new books for ResurrXion and two old books were rebranded, the Inhumans got a whopping three new books (and the two other Inhumans books that hadn’t been cancelled, Ms. Marvel and Moon Girl and Devil Dinosaur, were not rebranded using the ResurrXion logo). So, uh, that seems kind of lopsided. Moving on! The Inhumans post-Inhumans vs X-Men were in kind of a weird place. Whereas the X-Men were finally out from under the shadow of extinction (again), the Inhumans had lost the last Terrigen cloud and there were no more Terrigen crystals anywhere, so the ability to go through Terrigenesis was now impossible. Because Medusa was the one who destroyed the Terrigen cloud, she decided to step down as Queen and instead appointed Iso as the new Queen of the Inhumans. Which brings us to the three new Inhumans books. If the theme of the X-Men’s ResurrXion books was “back to basics,” the same was true of the Inhumans’ books — but, for the Inhumans, the “basics” were being incredibly goddamn weird. This is the flagship book for the Inhumans, written by Al Ewing and initially drawn by Jonboy Meyers, before switching to Thony Silas. 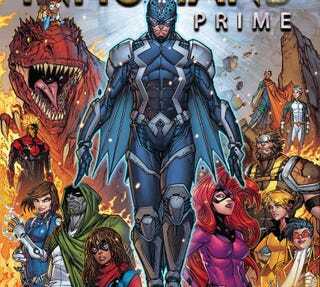 The plot is pretty simple: without Terrigen, the Inhumans are at a loss about how to make new Inhumans. But Marvel Boy, a Kree soldier from an alternate dimension, reveals that he knows the secret of Terrigen and Terrigenesis and that it’s somewhere on Hala, the dead Kree homeworld. So the Royal Family and Marvel Boy take a trip into outer space to find this secret. Al Ewing, who previously wrote Loki: Agent of Asgard and New Avengers, manages to make Royals into something supremely epic and incredibly weird. We get to know and understand the characters better, especially Maximus the Mad, who gets a surprisingly amount of character development. The book also seamless goes back and forth through time and still manages to make the present day stuff incredibly interesting. If you’ve never read about the Inhumans before, some things might be confusing (like the time they went and conquered the Kree empire), but overall, the book does a good job at explaining all of that and still being entertaining. A premise like that wouldn’t work without a great writer and artist and boy, did Marvel deliver: Saladin Ahmed, the author behind the incredible Throne of the Crescent Moon, is the writer and Christian Ward, the artist behind Matt Fraction’s Ody-C, is the artist and they manage the turn in a book that is both gorgeous and super goddamn weird at the same time. Ahmed’s characterization of the Midnight King is wonderful and human, but it’s his writing for the Absorbing Man and other prisoners that’s incredible, showing us the human face behind the supervillain. Also, Raava is your new favorite character. When this book was first announced, I was delighted. I love Ms. Marvel, I love Moon Girl and Devil Dinosaur, and I love Quake, so why wouldn’t I love a team book with them all together? It seemed like natural synergy as well with Agents of S.H.I.E.L.D. already having had a Secret Warriors team led by Quake. When I heard Matthew Rosenberg was writing it, that made me even more excited, because he writes one of my favorite indie comics (4 Kids Walk Into a Bank). So what could possibly go wrong? Well, the first issue came out and it was a tie-in to Secret Empire. The plot itself isn’t that bad, but it’s filled with flashbacks to what each character was doing before the event and it really just seems like padding. As for the characters, I can’t complain about them not feeling like themselves, because they do...it’s just that these characters tend to argue a lot and that gets tiring after a while. The fun moments are really fun, but they come after other moments when characters tend to act like dicks. Perhaps if this book hadn’t started right in the middle of a giant crossover or if the team was better put together, rather than just random popular Inhuman or if the story didn’t feel like it was going nowhere (I know Quake isn’t going to stop Hydra in her own book, it’s going to happen in the main book where she has made zero appearances), it would have worked a lot better. Or perhaps it’s the fact that a bunch of characters — including Yo-Yo, who is currently a part of Agents of S.H.I.E.L.D. — died off-screen with little fanfare that makes me say “meh” to this comic.